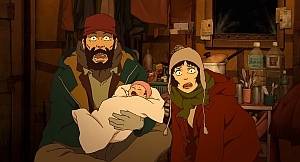 The most accomplished film by the philosophical genius of the anime genre, Satoshi KON. Three homeless people go on a breathtaking postmodern odyssey through one of the most amazingly rendered cityscapes ever produced in animation. About the director: Satoshi KON, born in 1963, made his debut as comic artist but soon found his way into animation. He first attracted attention working as sctipt writer and background artist on MEMORIES (Katsuhiro OTOMO).